This past Christmas my parents gave my sister, brother and I each a handmade mortar and pestle, which they found at a little store called L’autedu during a recent visit to Cinque Terre, Italy. Andy and I spent a couple days in Cinque Terre on our honeymoon. Five villages hug a terraced coastline along northern Italy’s Riviera and it’s, by far, one of my most favorite places in the world. It wasn’t until I graduated from college that I truly started to appreciate the handmade. Working as an editor at Popular Woodworking Magazine cemented my belief that a beautifully handmade item bought once in a lifetime, although more expensive, is, in the long run, worth much more than a similar item that’s mass-produced and of lesser quality. Yes, mass-produced is cheaper. But if you have to buy four dressers in your lifetime because the first three eventually wear out, is it, truly, cheaper? Of course, I, unfortunately, don’t have the financial means to fill my house with patiently handcrafted pretty things. But, I try. I save up to buy things (the Target dressers Andy and I have in our bedroom are falling apart yet I’d much rather have two antique or handmade pieces 10 years from now versus replacement particleboard ones now). I opt for antique instead of new (we found Sophie a beautiful, dovetailed antique dresser for the same cost as a fiberboard one from Ikea). I’m constantly on Craigslist (our crib, changing table, dining room wool rug and living room couch are all items I could never, ever afford in the stores they came from but through luck and time I found them slightly used and greatly reduced in price on this great site). And, like the mortar and pestle shown here, I have been blessed with many gifts. Some are from stores. Others, including quilts and blankets and hand-turned salad bowls and necklaces and earrings and dresses and artwork and bibs and burp cloths and jewelry boxes and tool chests, have been made by people I respect and love. I strive to not put much emphasis on things in my life. 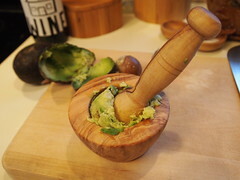 But at the same time, I love how a small thing of beauty can make the mundane act of mashing avocado for the boys’ dinner so much more enjoyable. I love how an object can take my mind from the kitchen to a place I think of often. I long to go back to Cinque Terre someday. And so moments like this, when my memory fills with the sights, sounds, tastes and smells of the Five Lands, help satisfy those longings, even if for just a few seconds. I could go on and on about this topic. The environmental and financial soundness of buying less by buying better quality. The importance of surrounding one’s self with beauty. The importance of supporting craft. And yet, I’m also embarrassed by this topic as I’m not a craftsman. I’ve tried sewing (I got a “B” on a stuffed bunny in 7th grade Home Economics because somehow I lost my needle inside of it). I’ve tried woodworking (with great, great help I’ve built an Arts & Crafts bookshelf, a Windsor chair and a Shaker end table but I never felt fully comfortable with the tools and I never felt like it was something I wanted to do on my days off). I’ve tried card making (my sister puts me to shame). I’m in awe of people like my mom who grows her own lavender, finds gorgeous antique linen and can put together a beautiful scented satchel in an afternoon. Or my mother-in-law who can take a handful of gorgeous beads and string them together into a small work of art you can wear around your neck. I suppose writing is a craft. But it’s not a tangible one. You can’t mash avocados with it. But I guess you can be taken back to a cobblestone street lined with colorful doors and laundry hanging from every window, the smell of homemade pesto, lingering, in the act of it. But still, you can’t hold it. Maybe someday, when the kids are all in school and the February days seem long, I’ll find a craft I love and can excel at. Until then, I’ll simply appreciate those who have already found their calling while tossing salad in our hand-turned bowl, watching a movie while cuddled under a hand-knit blanket or mashing avocado in a handmade mortar and pestle bought in one of my most favorite places in the world. This entry was written by kara, posted on February 28, 2011 at 5:06 pm, filed under Things I Love and tagged beauty, handmade. Bookmark the permalink. Follow any comments here with the RSS feed for this post. Post a comment or leave a trackback: Trackback URL.